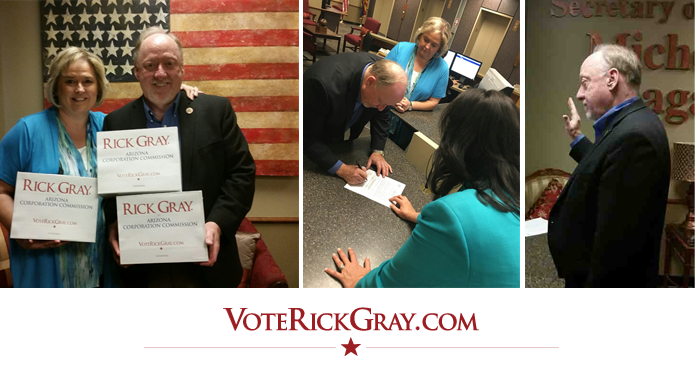 RICK GRAY, SUCCESSFUL BUSINESSMAN, STATE REPRESENTATIVE AND CANDIDATE FOR THE ARIZONA CORPORATION COMMISSION FILES OVER 9,200 SIGNATURES FROM ALL 15 COUNTIES. Phoenix – May 25 – Rick Gray, successful businessman, three-term State Representative and candidate for the Arizona Corporation Commission filed more than 9,200 signatures, almost double the number required by law to qualify for the ballot. These 9,200 signatures represent voters from all 15 counties. WE DID IT…WITH A LOT OF HELP! the state who helped make this happen! It was definitely a team effort! Collecting 9,201 signatures was a monumental task…but WE DID IT with A LOT of HELP! But we aren’t across the finish line yet. We are still in the process of collecting $5 contributions towards our clean elections funds. We need to collect 2,040 individual $5 contributions in order to qualify for clean elections. We are more than half way to our goal but need your help to cross the finish line and wrap this up by June 15th. To learn more about Clean elections, click here. Please consider donating $5 to the campaign. You can do this online but if you’d prefer you can also download the qualifying contribution form, fill it out and mail it to us. Any AZ registered voter, regardless of party affiliation can donate $5. Please don’t hesitate to contact me at 623.340.8091 with any questions. Be the first to comment on "Rick Gray Files Nomination Signatures for Arizona Corporation Commission"